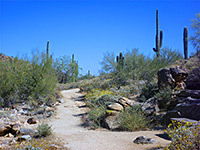 Most paths in the White Tank Mountains are short and fairly level, winding through cactus-covered plains and small hills, either side of the park road, but three longer trails climb high into the mountains and encounter more varied scenery, progressing up sometimes narrow, rocky canyons to grassy slopes and ridges, home to rather different vegetation than the lowlands. The trails intersect, allowing for several loop hikes, and perhaps the best is the 9.6 mile trip up Ford Canyon and down Mesquite Canyon, also involving the 1 mile Waddell Trail and the 1.6 mile Willow Canyon Trail. Ford Canyon is rated by the park as 'extremely difficult', a description which applies just to one other route hereabouts (Goat Camp), and it is accompanied by the most severe warning, for a 2 mile section towards the upper end; "hazardous trail, rough sections, narrow spots, large rocks in wash". 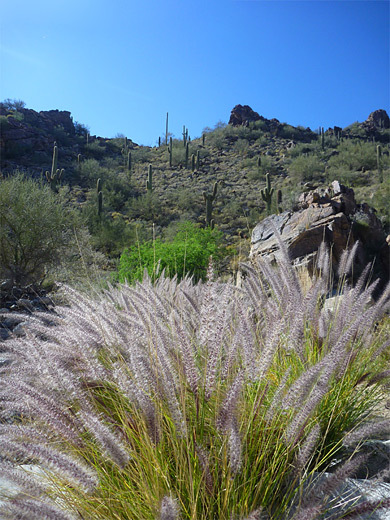 For a seasoned desert hiker, however, this trail presents no difficulties and indeed the rocky, narrow and steep parts help make this the most exciting path in the area. Anticlockwise is the recommended direction as the upwards elevation is more gradual and what is arguably the least interesting section - the crossing of open, flat land for 2 miles - is done at the start. 22 views of the hike, and the park. There are several possible start points for the Ford Canyon hike but the usual place is along a very short spur off Waterfall Canyon Road, which branches off the main road 2 miles from the entrance station. At road's end are a paved parking area, four ramadas and two paths - to the west is the Mesquite Canyon Trail, which will form the last part of the loop, while the Waddell Trail heads north. The Waddell Trail leads across a drainage then over flat terrain, lacking shade and so very hot for much of the year, past a scattering of saguaro and other cacti. The path rounds a little knoll, and crosses another wash to the junction with the Ford Canyon Trail, which eastwards leads to a few alternative starting points along the main road. To the west, the path rises over a saddle and continues across gently undulating ground to another minor high point, which gives the first long-distance views northwards, of the wide, level land at the mouth of Ford Canyon. The distant Phoenix suburbs can be seen to the east, while in the opposite direction the drainage narrows only gradually, and the mountain peaks still seem quite distant. The trail proceeds over sandier terrain, rising slightly, and staying a little way south of the broad, usually dry streambed until, after about 3 miles from the start, a notice warns of more difficult conditions ahead. 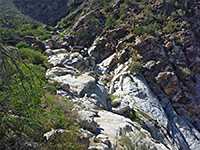 The trail becomes steep for the first time, zig-zagging up the south side of the canyon in order to pass a big, white, slickrock dryfall, before dropping back down to the wash bed, which is marked by patches of nice, water-polished white granite, rocks which give the mountains their name. A good selection of wildflowers are found along the sides of the wash, some of the more unusual being castilleja exserta, delphinium scaposum and dudleya arizonica. A few parts of the canyon are somewhat enclosed but soon the cliffs recede and the streambed is flatter, the surface now coarse sand, flanked by shady mesquite trees. The trail leaves the wash at about 2,500 feet elevation and climbs the grassy hillside to the south, where a different set of flowers grow, including calochortus kennedyi and dichelostemma capitatum. The route switchbacks a few times up a gentle valley to the high point of the loop (2,820 feet), where the tallest summits in the mountains are properly visible for the first time, most prominent being a nameless peak at 4,018 feet, supporting a group of radio towers. The trail descends briefly into the next drainage, Willow Canyon, and on to a junction. 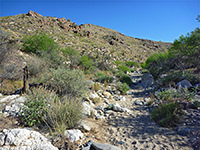 The final 0.7 miles of the Ford Canyon Trail continues south, to an intersection with the Goat Camp and Mesquite Canyon trails, while the 1.6 mile Willow Canyon Trail forks off eastwards, forming the next part of the loop. This crosses a small tributary ravine and then the main wash in the canyon, and afterwards stays level or rises slightly as the drainage drops down quite sharply, so the path becomes increasingly high above the wash, on the south side. More little gullies and a saddle are followed at by a short descent into the adjacent canyon (Mesquite), and to another junction, signed picnic area (the trailhead) 1.8 miles. This last stretch rises one more time to a final saddle, and moves into a short unnamed drainage, on the floor of which is a fence and 'Trail Closed' notice, since a shortcut path once climbed further upstream. Another fence a little further down has been installed to stop people cutting switchbacks, as the land slopes down, the hills open out and the trail reaches a junction at the start of the Waddell Trail, right beside the picnic/parking area.